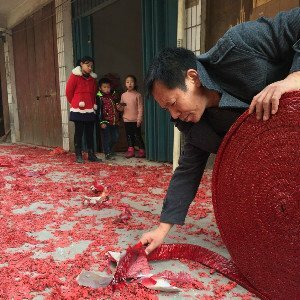 Here we&apos;ve rounded up 10 disappearing Chinese New Year traditions and superstitions. According to an ancient legend, the God of the Kitchen Stove would go to Heaven on the 23rd of the 12th month of the Chinese lunar year, and report to the Jade Emperor on what each household did in the past year. The sacrifice-offering ritual is held on the 23rd (in North China) or the 24th (in South China) of the 12th month of the Chinese lunar year, after which people enjoy delicious sacrificial objects such as sugar cakes, deep-fried pancakes, and bean-curd soup. It was said that the God of the Kitchen Stove would only say sweet things about each household after tasting sugar cakes. Many people from the villages have moved into modern houses without kitchen stoves now, like their counterparts in the cities, therefore Kitchen Stove God rituals are rarely seen now. It&apos;s believed by folks that nothing is a taboo for gods and humans between the 23rd and 30th of the 12th month of Chinese Lunar year, and there&apos;s no need to choose a specific date for getting married during these days. As a result most young people who worked in other cities used to hurry home and get married during these days. 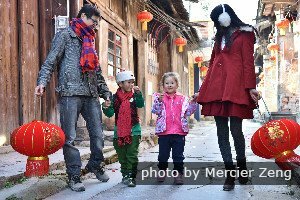 Now that Spring Festival is a public holiday in China, many couples get married during the Spring Festival, not because there&apos;s no taboo, or auspiciousness of dates, but because they have much more free time. The old saying goes that it&apos;s time to get the dough fermented on the 28th of the 12th month of the Chinese lunar year. Then each household was busy preparing food for the Spring Festival, especially steamed buns. In the past dough with yeast soon went bad, therefore people waited until two days before the Spring Festival to ferment the dough. This custom is rarely seen now because of the availability of baking powder, refridgerators, and bakeries. 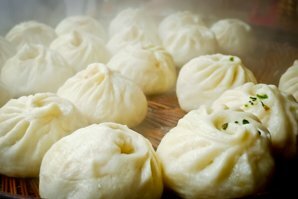 It was a custom for old Beijingers to prepare the main dishes for the Spring Festival on the 29th of the 12th month of Chinese Lunar year, including steamed buns stuffed with red bean and red date paste. It was considered unlucky by folks to steam buns and cook dishes from the 1st to 5th of the 1st month of the Chinese lunar year, therefore the people had to prepare steamed buns for the whole week on the 29th of the 12th month of Chinese lunar year. Steamed buns were usually decorated with red dots, adding luster to the Spring Festival. Now it&apos;s easy to buy steamed buns during the Spring Festival, but it&apos;s very rare to find ones with red dots. Learn Top 7 Lucky Food for Chinese New Year. Traditionally each Chinese household strived to be first to set off "opening-door firecrackers" at 12:00 AM, on the 1st day of Chinese New Year. 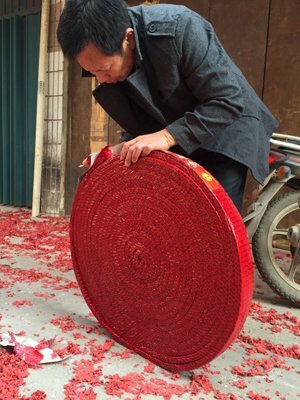 It was also a tradition to set off one string of small firecrackers first, followed by three big firecrackers, which symbolized ringing out the old year and ringing in the new year. The louder the three firecrackers, the better and luckier for business and farming in the coming year. Now setting off firecrackers is banned in many large cities in China, so you can only see this custom in more provincial and rural areas. 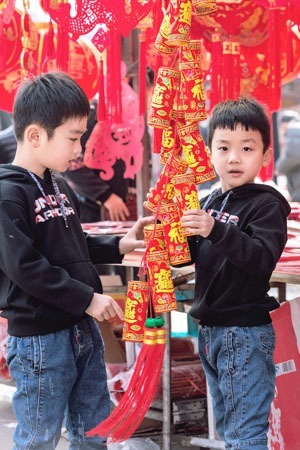 Learn why light firecrackers on Chinese New Year? 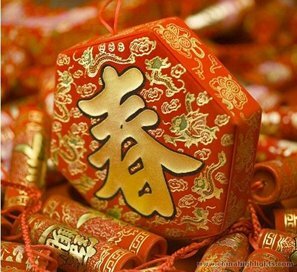 It&apos;s a custom to pay a New Year&apos;s visit to relatives and receive good-luck money on the 1st day of the Spring Festival. So there&apos;s lots of trash from entertaining guests. However, it&apos;s considered unlucky to use a broom to sweep the floor, dump trash, or splash water on that day (or the 2nd day). Folk "spring clean" on New Year&apos;s Eve, as part of saying goodbye to the past year, which is still a popular custom, but they don&apos;t want to "sweep away their new Year luck". Now this custom is rarely seen in cities, but is still popular in rural areas villages. Want good luck in 2019? Don&apos;t do these things. It&apos;s a custom for folks to offer a sacrifice to the God of Fortune on the 2nd day (in North China) or the 5th day (in South China) of the Spring Festival. The sacrifice-offering rituals are held in stores or at home, with a whole pig, goat, chicken, duck, or live carp as sacrifices, for luck in the coming year. According to folklore, the God of Fortune refers to the Five Roads God. The Five Roads are the South Road, the North Road, the Central Road, the West Road, and the East Road. Scarlet Dog Day (赤狗日), on the 3rd day of the Spring Festival, is an unlucky day according to folklore. The legend went that the Scarlet Dog was the God of Anger, and whoever met him would have bad luck. 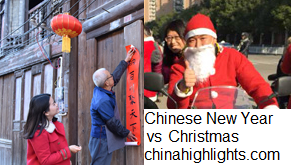 So Chinese would neither pay New Year&apos;s visits nor receive any guests on this day. Instead, they superstitiously stayed at home all day long. Modern Chinese people have done away with this feudalistic superstition, and visit friends on the 3rd day of the Spring Festival. As mentioned above, folk send the God of the Kitchen Stove to Heaven on the 23th of the 12th month of the Chinese lunar year. On the 4th day of the Spring Festival they welcome him back by burning incense and paper representing money, setting off firecrackers, and offering sacrificial objects such as meat and fruits. 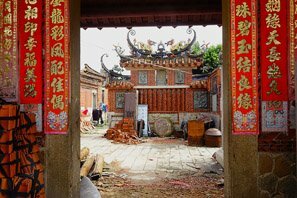 The legend also went that the Jade Emperor would send another god to inspect each household at the time of the return of the Kitchen Stove God, so it was not suitable for folks to leave home on the 4th day of the Spring Festival either. Nephews, however, were allowed to visit their aunts then. Now it&apos;s very rare for Chinese to offer sacrifices to the God of the Kitchen Stove, let alone greet him back from heaven. The legend went that the God of the Poor was very short and thin, and was fond of dressing in rags and drinking porridge. Even though folk sent him new clothes, he would first tear them and then wear them. As a result, folk would send him off to heaven rather than see him in rags on the earth on the 6th day of the Spring Festival. It was very popular for folk to see the God of the Poor off during the Tang Dynasty (618–907), however the custom is almost gone now.